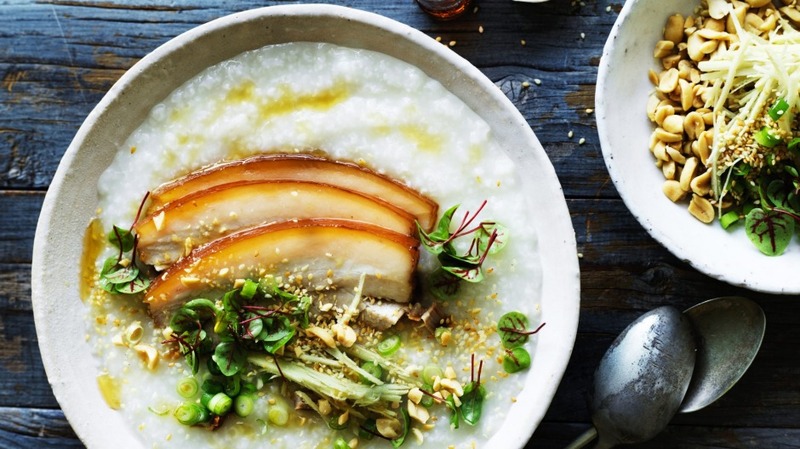 Chinese rice congee is guaranteed comfort food, especially studded with sweet belly pork and the warmth of fresh ginger. 1. Rinse the rice well in cold running water and drain. 2. Combine rice, pork belly, half the ginger and cold water in a large pot, and bring slowly to the boil, skimming. Reduce to a gentle simmer, and cook over low heat for three hours, partly covered, until creamy. Stir occasionally, to stop the rice sticking on the base. Add more water if too thick, or cook longer if too thin. Season with salt and pepper. 3. Remove the pork belly and wipe dry. Heat the soy sauce in a small pan and place the pork belly, skin side down, in the soy for two minutes to brown the skin, without allowing the soy to burn. 4. To serve, finely slice the pork. Divide hot congee between four deep soup bowls. Top with egg, remaining ginger, spring onions, salted peanuts, sesame seeds and sesame oil, and serve hot, with soy sauce. If you love this comforting breakfast recipe try Jill Dupleix's bean and bacon roll.